Now that Google launched a new photo sharing service (Google Photos), it's interesting to see what happens with Google+ Photos. Google has a new Android app for Google Photos. Until now, the Google Photos shortcut linked to the Google+ app. A recent update to the Google+ app removed the Photos section, so you can no longer check your photos from Google+. 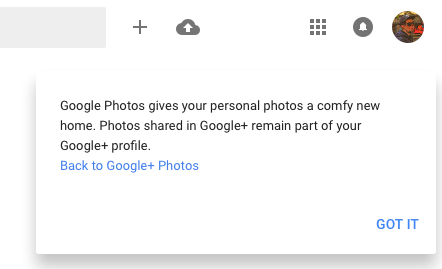 The desktop Google+ site redirects users to the new Google Photos and shows this message: "Google Photos gives your personal photos a comfy new home. Photos shared in Google+ remain part of your Google+ profile." There's also a link to Google+ Photos. Picasa Web Albums, Google+ Photos and the new Google Photos are different interfaces for the same photo library. Now that Google Photos doesn't require Google+, it's likely that Google can finally retire Picasa Web Albums and replace it with Google Photos.